European football's governing body Uefa has complained to Fifa about an "alleged smear campaign" against its president Michel Platini. Uefa has asked world football's governing body to explain the apparent distribution from their headquarters of a document entitled 'Platini: Skeletons in the closet'. It was sent anonymously to several newspapers, reports Welt am Sonntag. Platini is running to succeed Sepp Blatter as Fifa president. The election is due to take place in February, with former Fifa vice-president Chung Mong-joon of South Korea, ex-Brazil player Zico and Liberian FA chairman Musa Bility having also said they will stand. "The document, seen by BBC Sport, is entitled 'Platini: Skeletons in the Closet' and paints an unflattering picture of Michel Platini, asking whether he is suitable to replace Sepp Blatter as Fifa's president. "Platini is the only member of Fifa's executive committee to admit voting for Qatar's controversial 2022 World Cup bid." "I can confirm that Uefa general secretary Gianni Infantino sent a letter of complaint to Fifa general secretary Jerome Valcke," a Uefa spokesman said. "We have asked Fifa to investigate the origin of this article because we are concerned by the reports of an alleged smear campaign against the Uefa president. "Copies of this letter were also sent to [Fifa's independent chief ethics investigator] Cornel Borbely and [chairman of Fifa's audit and compliance committee] Domenico Scala for ethics and transparency reasons." Fifa did not respond to a request for comment on the report in the German newspaper. 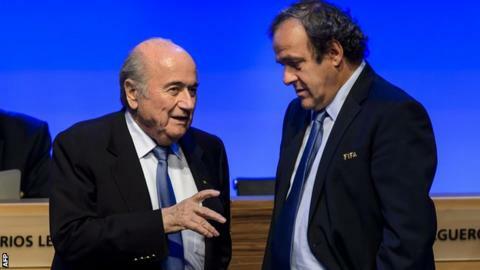 Former France captain Platini was once a close ally of Blatter but their relationship has deteriorated, with Platini telling Blatter to resign as Fifa president in May, shortly before he did so. In an interview with Dutch newspaper Volkskrant on Saturday, the 79-year-old Blatter said there was an "anti-Fifa virus in Nyon", the Swiss region which is home to Uefa.